Delivery of API molecules to the brain is a challenging task. The main aim of this review is to present ocular route as a powerful region and focus on the various Nano-formulations. 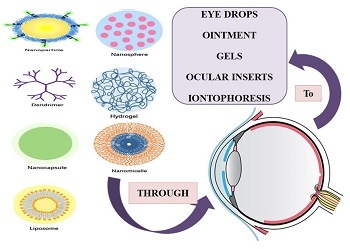 Various efforts in ocular drug delivery have been made to improve the bioavailability and to prolong the residence time of drugs applied topically onto the eye. Poor bioavailability of drugs from ocular dosage form is mainly due to the tear production, non-productive absorption, transient residence time, and impermeability of corneal epithelium. Though the topical and localized application are still an acceptable and preferred way to achieve therapeutic level of drugs used to treat ocular disorders but the primitive ophthalmic solution, suspension, and ointment dosage form are no longer sufficient to combat various ocular diseases. This article reviews the constraints with conventional ocular therapy and explores various novel approaches, in general, to improve ocular bioavailability of the drugs, advantages of vesicular approach over these and the future challenges to render the vesicular system more effective.